Have you ever thought about going back to school, but put it off for financial reasons? Mayo Clinic offers employees assistance for professional development. The program is offered as a benefit for Mayo Clinic employees and reimburses education expenses related to a degree or certification that supports career development at Mayo Clinic. Three colleagues share their thoughts and experiences about how the program has helped them. In your journey to further your education, what has the overall experience been like? Did the Mayo benefit influence your decision to go back to school? Would you recommend this benefit opportunity to your fellow colleagues? If you are interested in employment opportunities at Mayo Clinic, visit our website at http://www.mayoclinic.org. Teamwork is critical in Mayo Clinic’s Surgical Intensive Care Unit (SICU). Working right alongside the team of physicians, Clinical Nurse Educators work to plan and prep for the nursing skills associated with new processes and the use of the unit’s complex equipment. Working in such a high-tech, high-touch environment is rewarding and allows you to see how the results of your work directly affect and benefit a patient. Staff in the SICU take pride in caring for such ill patients and their families in a caring and competent way. I see the role of an SICU Clinical Nurse Educator as one of leadership. The SICU staff is made up of both seasoned and new graduate nursing staff, and the Clinical Nurse Educator’s charge is to assess the educational needs of all staff members. Jill Henderson, Clinical Nurse Educator on 5N Surgical Services, says she really enjoys sharing information with the staff to improve their performance and their level of patient care. Mayo Clinic’s Florida campus is currently searching for a Master’s prepared Clinical Nurse Educator in the SICU. Please visit mayoclinic.org/jobs-jax to learn more and apply online. Almost two years after the opening of the new hospital on Mayo Clinic’s Florida campus, employees still get pumped up about working in the state-of-the-art operating rooms (ORs). The cardiothoracic surgery team has two designated heart operating rooms, each averaging more than 700 square feet in size, spacious by OR standards. They are equipped with ceiling-mounted high-definition monitors and two booms with video equipment that can be controlled from the nurses’ area. Cardiothoracic surgeons Dr. Kevin Landolfo, Dr. Richard Agnew and Dr. John Odell bring a variety of experience and diversity to the team. Surgeries range from the routine, such as coronary artery bypass grafting including off-pump procedures and heart valve replacement and repair, to MAZE procedures, implanting ventricular assisted devices, heart and lung transplants, aortic root surgery, thoracic aneurism repair, ventricular remodeling and minimally invasive heart procedures. Later this year, robotic- assisted heart surgery will be done. Wally Caldwell, a registered nurse and coordinator of Cardiac/Vascular Surgery, says one of the joys of working at Mayo Clinic is that all physicians work for the institution and share the same core values as the staff. This adds to the quality of care and coordination within the OR. Wally’s greatest inspiration is when he is able to visit with the patients after surgery and witness their progress in recovery. “There are many times where the patient can’t breathe, and two days after surgery, they are talking and eating,” he says. Patients are what bring him to work everyday, he says. To become a member of this wonderful team or learn more about our staff, visit our website at http://www.mayoclinic.org/jobs-jax/. Written by Jennifer Lineburg, recruitment coordinator at the Florida campus. Information given by Wally Caldwell, registered nurse and coordinator of Cardiac/Vascular Surgery at the hospital. It’s always exciting to see someone graduate from school — whether it’s a high school graduate embarking on life or a college graduate who feels liberated from school and eager to start a new career. To me, the most exciting time is when I get to meet the newly graduated nurses. They are filled with such enthusiasm for nursing. As the new graduate nurse recruiter at the Florida campus, I get the opportunity to hear their stories of studying medications, learning new diagnoses or being there for a patient who just needed a hand to hold. They share with me their drive and ambition to be the very best nurse possible! Along the way, I get to hear how well they are doing in their new role. If I’m lucky, I get to see those same nurses after their orientation and get to hear about how much they enjoy working at Mayo Clinic and the support they receive from their colleagues. If you would like to know more about our new graduate program or any nursing opportunities at Mayo Clinic in Florida, please visit http://www.mayoclinic.org/jobs-jax/. Our next program will be accepting applications from January 25-31, 2010. We created a pilot project that involved nurses and patient care technicians checking on patients every two hours and assessing the 5Ps: pain (what is the patient’s pain level? ), potty (do they need the restroom? ), position (how comfortable is the patient? ), proximity (is everything they need within reach?) and personal needs (is there anything else they need?). Our patient surveys have continued to be very positive, and we are now closer than ever to providing consistently excellent care as a team. It is a remarkable feeling when I look around: my co-workers’ days are easier and patients are happier because we are a part of something that has brought the caregivers’ workflows together to be a stronger force in an individual’s healing process. If you are interested in working at Mayo Clinic, please visit http://www.mayoclinic.org. Written by Caroline Morrison, a monitor tech on the General Surgery/Bariatric Surgery unit in the hospital at Mayo Clinic’s Florida campus. On Dec. 29, 2006, my husband and I adopted a beautiful little girl we named Lilly. I was surprised — and thrilled — at the response and generosity from my co-workers at Mayo Clinic. Friends, colleagues and acquaintances showered us with goodies from diapers and bottles to outfits and toys. Having the opportunity to adopt a child, while definitely a blessing, can be an emotional and financial rollercoaster. But the outpouring of support from my colleagues, as well as the numerous resources offered by Mayo Clinic for employees looking to adopt, reminded me why I feel so lucky to work at this institution. According to a recent survey from Hewitt Associates, more than 39 percent of major U.S. employers offer adoption benefits. Mayo Clinic has been providing the benefits to employees for more than 20 years. Adoption consultation and referral services are available to Mayo Clinic employees seeking to adopt a child or stepchild as well as financial assistance of up to $10,000. Mayo’s plan is unique because it does not place a limit on the number of adoptions per employee. Those who have taken advantage of Mayo’s benefits say the support makes the entire process more enjoyable. For more information, visit the benefits link in the jobs Web pages for each Mayo Clinic campus. Written by Dana Baker, compensation and benefits analyst, with assistance from Katie Phelan, administrative fellow at Mayo Clinic in Florida. Written by Linda Rhodes, coordinator of Management Development at Mayo Clinic’s campus in Florida. Registered nurse Jessica Charles recently relocated across the country to take a new position as nurse manager of Neurology, Neurosurgery and Orthopedics at Mayo Clinic in Florida. However, this was not Jessica’s first experience working at Mayo Clinic. She came from Scottsdale where she was a nurse supervisor at Mayo Clinic in Arizona. Jessica tells why she wanted to work for Mayo Clinic and her experience as a new employee at the Florida campus. Like Jessica, new staff often tell us how enthusiastic and excited they are to be working at Mayo Clinic. From the moment new employees set foot on Mayo Clinic’s campus, the experience is about orienting them to the organization and the culture so they feel secure and welcomed. New employees begin their careers with two days of orientation training. The campus chief executive officer and chief administrative officer come to orientation to greet new staff. This is a rare event at most organizations. But Mayo’s leaders believe it is an investment into each new employee’s assimilation and satisfaction with the organization. For more information on available jobs at Mayo Clinic visit our Web site at http://www.mayoclinic.org/jobs-jax. 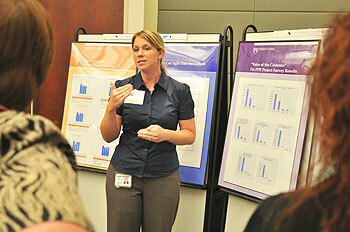 Mayo Clinic’s campus in Florida kicked off a new nursing residency program in February. Diane Lassiter, Sara Warren, Rachael Ruffet and Carol DelaCruz are the first nurses to participate in the year-long pilot program. “We are concerned about the pending nursing shortage, so we want to embrace recruitment and retention of this important profession,” explains Debra Hernke, chief nursing officer. Studies show up to a 40 percent turnover in some institutions in the first year of nursing. “If someone leaves a position in the first year of nursing, they most likely will leave the profession altogether,” she says. The program is an outgrowth of Mayo Clinic’s involvement in First Coast Nurse Leaders (FCNL), a consortium of chief nursing officers and nursing school deans in Northeast Florida. Flagler Hospital and River Garden Long Term Care also are participating in the program. FCNL received a grant from the Florida Center for Nursing to develop the curriculum. Participating nurses are assigned an open position in a nursing unit, provided a thorough orientation with a preceptor, and also complete a three-credit course through the University of North Florida or Jacksonville University during the residency program. The curriculum is designed to provide the necessary tools and support to help each resident begin a long-term nursing career. Residents are assigned a nurse mentor to help them assimilate and succeed in the workplace. For more information about the Department of Nursing at Mayo Clinic’s campus in Florida, please visit our Web site. Jennifer Lineburg is a recruitment coordinator at Mayo Clinic Florida.